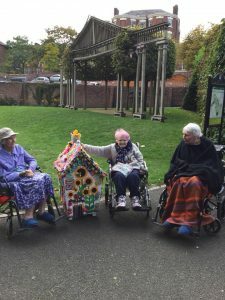 The Duck House Trail is the Festival’s 2018 Community Arts Project, hosted throughout October. It is a wonderful walk through Bewdley’s Jubilee Gardens following a trail of duck houses. 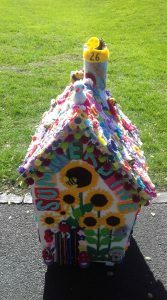 Each of these is decorated by organisations within the local community. 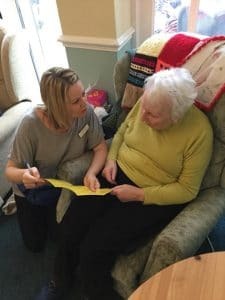 This year Sam Morris, one of our care staff and Nikki Farmer, our head housekeeper/carer, thought it would be a great idea for Summerdyne to take part. As always, our staff and residents embraced the idea and wholeheartedly threw themselves into the project. The wooden duck houses are all the same size and design , which gives a blank canvas ready to be decorated. They were made earlier in the year by the Emily Jordan Foundation, a Kidderminster based charity which offers meaningful work experience for people with learning difficulties. We collected our duck house in August. 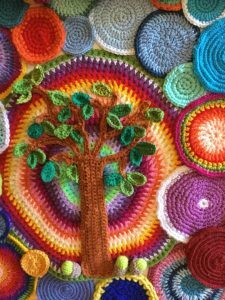 Our idea was to yarn bomb it, with a garden inspired design to reflect the warmth and happiness of our home. Sam and Nikki headed up our knitting and crocheting team for the project. 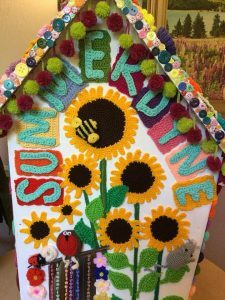 We have a number of keen knitters at Summerdyne who knitted squares, or donated previously knitted items, to decorate the house. Many members of staff, including Sarah, Audrey, Nancy, Rose, Lorraine, Caroline and Ruth all helped to cover the house. 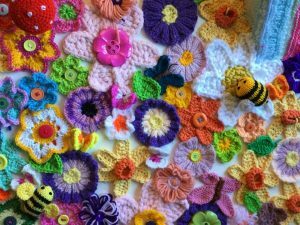 We also involved Wribbenhall Knit and Natter (where our resident Barbara is a member) who donated lots of knitted flowers for us to use. 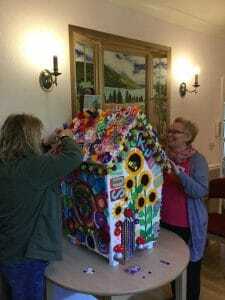 Another resident’s daughter was delighted to see the knitted ladybird she had made on the duck house. One resident, Pinky, donated a lovely bracelet to make into a dog collar for the knitted dog. 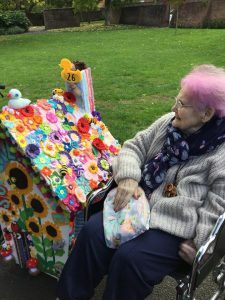 The duck house was worked on in our lounge area, so residents and visitors were able to see each stage of its creation and the hard work involved. It really was a team effort. Apologies to anyone who helped and who is not named here – but please know all your efforts were hugely appreciated. The duck house really encapsulates Summerdyne. It is so cheerful and a riot of colour. Every space covered in beautifully knitted flowers with huge sunflowers next to the door and our name proudly emblazoned above. The care and thought that has gone into the design is incredible. 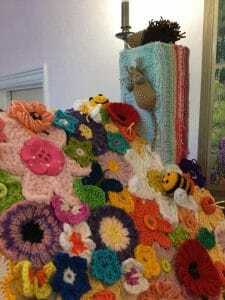 Knitted bees, butterflies and toadstools dotted among the flowers. Knitted birds and mice and a gorgeous dog and hedgehog. Even an oak tree with tiny knitted acorns at its base and some poppies to remember those lost in the wars. Our masterpiece duck house is exhibited, with the other 35 duck house entrants, along The Duck House Trail. All the duck houses enter into a competition and the public vote for their favourite. Ours is number 26! The winner is announced at the end of October and afterwards we get to keep our duck house. 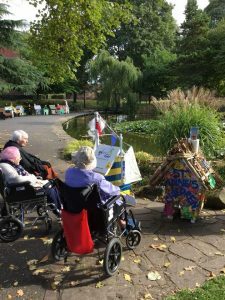 It has made for some lovely excursions with residents, to visit The Duck House Trail and cast our votes. Rightly so, they are very proud of our entry and we believe it’s a winner. We will keep you posted as to how we get on. Best of luck to everyone at Summerdyne!